Not to be confused with East Korea Bay. 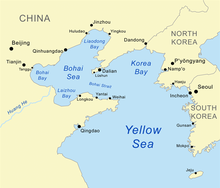 The Korea(n) Bay, sometimes the West Korea(n) Bay (Hangul: 서조선만 or 서한만; Hanja: 西朝鮮灣 or 西韓灣; Korean pronunciation: [sʰʌdʑosʰʌn.man] or [sʰʌhan.man]), is a northern extension of the Yellow Sea, between Liaoning Province of China and North Pyongan Province of North Korea. It is separated from the Bohai by the Liaodong Peninsula, with Dalian at its southernmost point. ^ Merriam-Webster's Geographical Dictionary, Third Edition. Springfield, Mass. : Merriam-Webster. 1998. p. 605. ISBN 0-87779-546-0. ^ Merriam-Webster's Geographical Dictionary, Third Edition. Springfield, Mass. : Merriam-Webster. 1998. p. 606. ISBN 0-87779-546-0. ^ Merriam-Webster's Geographical Dictionary, Third Edition. Springfield, Mass. : Merriam-Webster. 1998. p. 647. ISBN 0-87779-546-0. ^ Merriam-Webster's Geographical Dictionary, Third Edition. Springfield, Mass. : Merriam-Webster. 1998. p. 300. ISBN 0-87779-546-0. ^ Merriam-Webster's Geographical Dictionary, Third Edition. Springfield, Mass. : Merriam-Webster. 1998. p. 1321. ISBN 0-87779-546-0. ^ Merriam-Webster's Geographical Dictionary, Third Edition. Springfield, Mass. : Merriam-Webster. 1998. p. 1092. ISBN 0-87779-546-0. "Ta-lien-wan" . New International Encyclopedia. 1905.